The fall season of Wine Wars book events (which I am modestly calling The Wine Wars World Tour) kicked off last week with a well-attended talk at the University of Puget Sound. My calendar is starting to fill up so I think it’s time to post a schedule for September and October. I have created a World Tour page (click on the link) that I’ll update whenever a new event is added to the list. Hope to see you somewhere down the road at a Wine Wars World Tour book talk or signing! “The Miracle of Two Buck Chuck and the Revenge of the Terroirists.” Saturday September 17 2011 11:00 am in McIntyre Hall 103, University of Puget Sound. ”Wine Wars: A Tale of Curses, Miracles and Revenge.” Thursday September 29 2011. 7:30 pm Linfield College, McMinnville, Oregon. “Wine Wars: A Tale of Curses, Miracles and Revenge.” Friday September 30 2011. McMinnville Rotary Club, McMinnville, Oregon. Wine Wars Book Signing and Wine Tasting. Saturday, October 1, 2011. Powells Home and Garden Bookshop & Pastaworks Hawthorne Street. 2-4 pm. Portland Oregon. World Premier of Boom Varietal. Oregon Film Festival, Bend Oregon. Friday, October 7 and Saturday October 8, 2011. I appear in this interesting independent documentary on the Argentina Malbec boom. San Francisco Treasury Symposium keynote address “Wine Boom and Bust — with lessons for Finance in the 21st Century.” Thursday October 20, 2011. Palace Hotel, San Francisco California. World Affairs Council of Seattle. Thursday, November 3, 2011. Details tba. Washington Association of Wine Grape Growers. Thursday, November 17, 2011. Details tba. Retired Teachers Association of Tacoma. Saturday, December 3, 2011. Details tba. Unified Wine & Grape Symposium, Sacramento, California. Wednesday, January 25, 2012. Details tba. Book talk at an historical Napa Valley winery. January 27 or 28, 2012. Details tba. 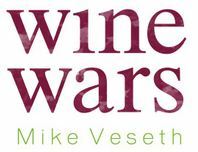 Please contact me if you are interested in hosting a Wine Wars book event. Mr. Veseth’s book is one of the top wine books ever written. Delightful and plush with innovative observations. Wine activists jump in.